George Landais and Ronnie Conlon capped impressive pre-season performances with goals in the local derby against Burgess Hill Town on Friday night. 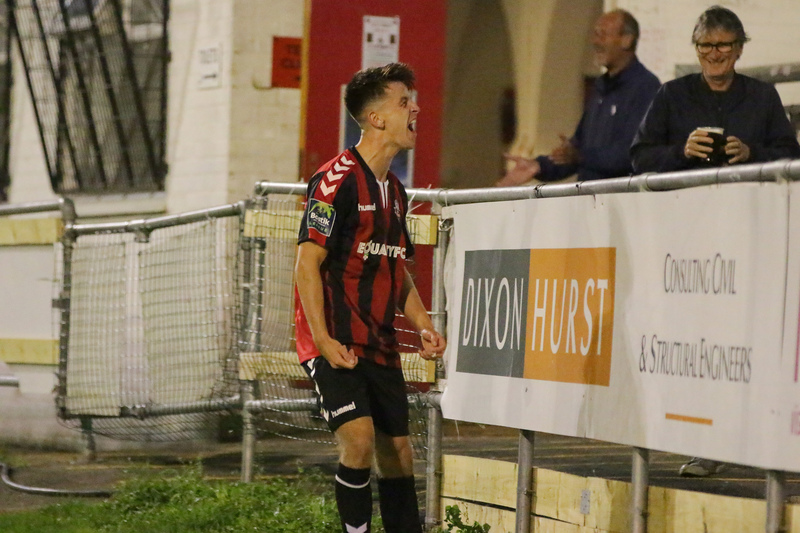 A George Landais brace helped Lewes to an impressive 3-1 victory over Bostik Premier side Burgess Hill Town in their final pre-season friendly at the Pan reports Tom Harper. With the start of the league season only eight days away, Darren Freeman picked the strongest side available to him but was only able to name four substitutes due to several key players carrying injuries. Burgess Hill started brightly and took the lead after just 11 minutes through Hakeem Adelakun, who sent a curling effort from the right-hand side of the penalty area past Chris Winterton and in off the far post after the Lewes defence had been caught out by a short corner. Things got even worse for the Rooks as the half progressed, as both Lloyd Cotton and Bouwe Bosma were forced off with injuries before the half-hour. The visitors were seeing most of the ball and always looked dangerous with their pace and power in the final third, but were unable to test Winterton for the remainder of the half. Lewes equalised slightly against the run of play on the stroke of half-time through George Landais, who sent a superb curling strike over the head of Max Hunter and into the top corner after a Reece Williams-Bowers corner from the right found him with time and space on the left-hand side of the penalty area. This goal seemed to galvanise the Rooks at the start of the second half, as they moved the ball moved the ball around well in midfield without really testing the Burgess Hill back four. The visitors continued to look dangerous going forward though, and saw Tony Garrod denied twice by Winterton in a matter of minutes as they looked to regain their lead. Lewes made the most of this by taking the lead with 20 minutes remaining. Landais was the scorer again, as he converted a Williams-Bowers cut-back from close range after a Ronnie Conlon cross from the left had picked out the winger at the far post. The Rooks were playing their best football of the game at this stage, and saw a trialist have an effort from the edge of the area deflected just over the bar after good play from Williams-Bowers. From the resulting corner taken by Gus Sow, Steve Brinkhurst had a glancing header at the near post cleared off the line and behind for another corner at the far post by a covering defender. From this corner, the Rooks doubled their lead, as Brinkhurst headed Sow’s delivery towards goal, Landais saw his attempted flick blocked, and Conlon ran onto the loose ball and found the bottom corner with a close-range effort. The visitors nearly pulled a goal back immediately, with Pat Harding beating Nathan Stroomberg to a through-ball but seeing his effort superbly cleared off the line by the covering Harry Reed. There were no other chances of note in the closing stages, but plenty of positives for the Rooks to take from an impressive second-half performance and result against a side from a higher division. James Boyes' pictures from the game can be found here. Lewes begin their Bostik Division One South campaign at Herne Bay next Saturday, kick-off at 3pm. Lewes: Winterton, Reed, George, Bosma, Brinkhurst, Cotton, Williams-Bowers, Sow, MacDevitt, Landais, Conlon. Subs: McCarthy, Stroomberg, A Trialist, Gunn. Burgess Hill Town: Hunter, Diallo, Fisk, Miles, Toure, Richmond L. Harding, Adelakun, Garrod, Smith-Joseph, Brivio. Subs: P. Harding, Gayler, Nezval, Camara, Bolton, Cook, Shaw.